Remember needing Cygwin back in the day, but after using it for my only occasion forgot the software-libraries completely? That happened to me. I have installed Windows 7 again and found my C:cygwin folder with all the files. Wanted to get rid of it, but no way – a mysterious “permission denied” when deleting the files. It seems there’s no way to remove it. Cygwin protects the files with some security stuff. That’s just idiotic, having no access to my own files! Here’s how to remove Cygwin once and for all. 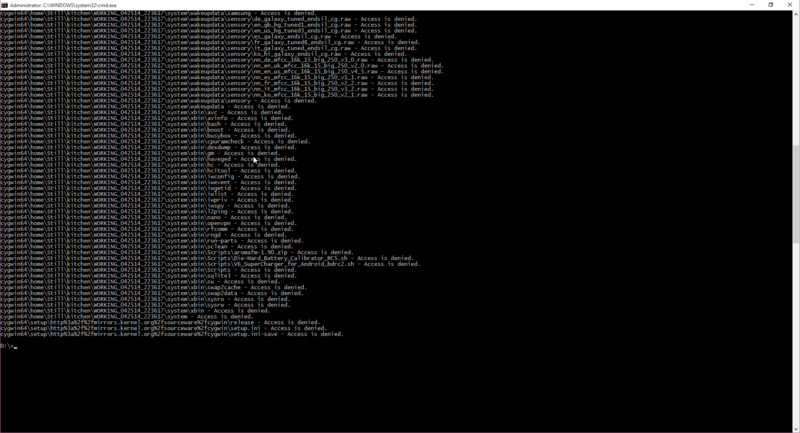 Run cmd, navigate to C: (or another disk, if you have installed it in a different path). Thank you. Can you tell me how to come up with this solution? I usually find every solution by experimenting, this was no different. 🙂 I trust in the power of command line! I do the same. Unlikely so, your method did not work for me because Cygwin was no longer working on my PC (my PC has crashed several times after I left it), So instead of all those 3rd Party apps, I experimented. What I did was, I used the inbuilt system of Windows (properties). Then the Security tab, and I found that I could not change the permissions for now. Then I went to Advanced, then to Owner tab, to find that the ownership was set to my previous account (one that I used before my system crashed). I clicked on my current account and clicked apply. Then I went to Permissions tab, and then I found that I could grant myself Full Control over the folder. Yay! Then I deleted it, once and for all. I feel you should also add this method to the list, for the needy. Even though the post is about an year old. This worked perfectly!!!! Well Done and Thank You. I tried it but the bin and etc directories remain. I can’t even open the etc directory. Hi, I got rid of them once I killed the bash process that was running. Thanks for the great information. Much appreciated. No probs! Great that you got it solved! Good job. What I need is the procedure. Thx Roni for your post. I haven’t run the takeown command but did run the last two commands. Is it still hiding inside my registry (win7)? Awesome. I had this huge cygwin folder that I was fighting to get rid of for several months.You solution solved in a few minutes. Thanks! thank you! your solution worked great for me! Frankly, your method did not work for me. Mainly because Cygwin was no longer working. I had installed it long ago, with a different account on my XP. But then my System crashed, and I had to recover my OS. But now the account did not exist anymore, neither the Cygwin.bat worked (tried running it through cmd too, but no success). I thought of trying Unlocked and Long Path Tool. None worked, as Unlocker hanged and stopped responding, whereas LPT asked for a Key (I don’t like spending money on stupid things). So I used my own brain. i am not even sure of what I did, I just kept trying till I succeeded. 1- I right-clicked it and opened up the Properties. I clicked the Security tab, to find that I could not change the permissions here (I could not grant myself full control). 2- Clicked “Advanced” and then in the “Owner” tab, I clicked my own account and then checked some box “Replace owner…”. Clicked Apply. I could not grant full control still. 3- Went to Permissions tab. Clicked on my account name, and then ticked both boxes below, and then clicked Apply. Finally, I granted all accounts full access from the Security tab. Then I deleted the folder. That folder was taking 4 GB of space from my HDD! Phew! So guys, just remember to use your own brain and not to depend on 3rd party softwares. Windows has its own features, and most of the time you won’t require all those things. Yeah, this tutorial is for those who had it on the same machine. Cygwin acts by default leaving files behind… you did practically more advanced version of my technique but using UI instead of cmd. 🙂 thanks for the advice! wracked my brain on this for 2 days.. tried so many things finally used your process and IT WORKS. Thanks a Lot !! thanx. But check your cywin folder name in localdisk (like cygwin64). Use that one in the place cygwin in the above code.